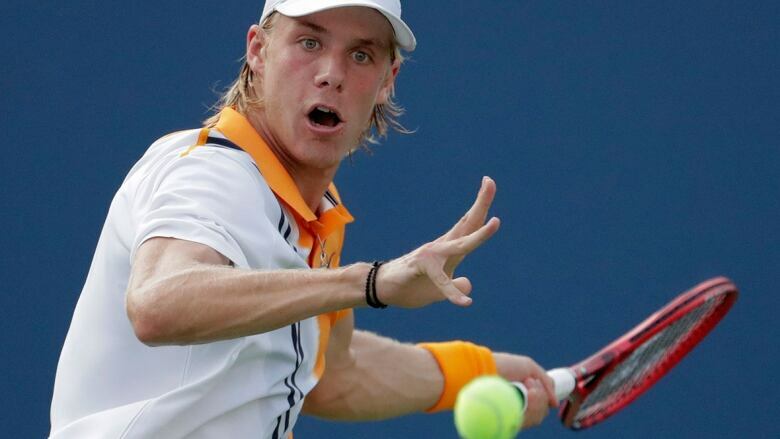 Canada's Denis Shapovalov is moving on at the U.S. Open after his compatriot Felix Auger-Aliassime was forced to retire in the third set of their first-round match on Monday. The clash between the promising Canadian teenagers was cut short with Shapovalov leading 7-5, 5-7, 4-1. Montreal's Auger-Aliassime, who was making his first appearance in the main draw of a Grand Slam, was attended to by medical staff during a changeover in the third set and said his heart was racing. The 18-year-old attempted to return to play after a pause, but retired after looking out of sorts for the next three games. Shapovalov, from Richmond Hill, Ont., embraced a tearful Auger-Aliassime at centre court after the match ended. "It's tough to see a friend go down like that. It was tough. When I saw that he was struggling, I still had to keep trying to win, keep kind of pounding it on him. It wasn't easy for me," Shapovalov said. "This match — it's great for Canadian tennis. Two young guys that are coming up, that have grown up together, playing against each other. "It's really good. I feel that's the reason why so many Canadians are picking up tennis rackets. Honestly, it's great when these matches happen." Both teens struggled with the consistency of their service game. Shapovalov launched four aces, nine double faults and got just 55 per cent of his first serves in. Auger-Aliassime, meanwhile, had three aces, nine double faults and landed 53 per cent of his first serves. The 28th-seeded Shapovalov also fired 25 winners and had 48 unforced errors, while his Canadian counterpart had 10 and 45, respectively. Shapovalov is 19, making him the youngest player in the ATP top 100. Auger-Aliassime just turned 18 on Aug. 8, making him the youngest player in the ATP top 200. Their combined age made this the youngest U.S. Open men's match since 2006, when Novak Djokovic, 19, beat Donald Young, 17. What made this one all the more compelling was the history shared by the two Canadians. They go back to when they were seven or eight years old, Shapovalov said. In other men's first-round action, Vancouver's Vasek Pospisil downed Lukas Lacko of Slovakia in straight sets 7-5, 6-3, 6-2. Pospisil will face Rafael Nadal in the second round after David Ferrer was forced to retire with Nadal ahead 6-3, 3-4. 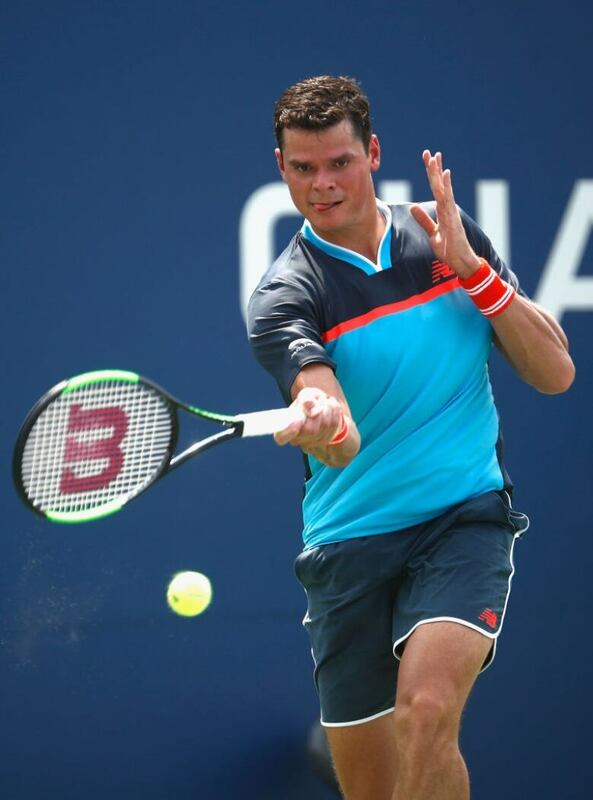 Canada's Milos Raonic advanced to the second round of the U.S. Open with a 7-6 (4), 6-4, 1-6, 6-3 victory over Argentine qualifier Carlos Berlocq on Monday. It wasn't a clean win for Raonic, who committed 45 unforced errors compared to Berlocq's 11. Raonic, the 25th seed in New York, will next face France's Gilles Simon. Raonic owns a 4-1 advantage in the head-to-head series with Simon, including both meetings on hardcourts.